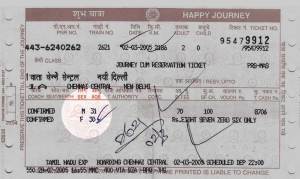 The PNR status of your IRCTC or Indian Railway ticket can easily be checked on our website. Just enter your PNR number and click the button where indicated. A new window will appear showing your current status. What is PNR status and what does it tell me? PNR status is the status of your booking. It tells you whether your ticket is confirmed, wait listed, reserved, etc. When do I need to know my PNR status? 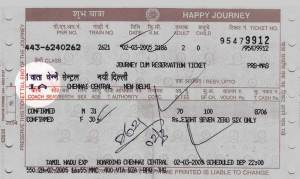 When traveling by train in India, you may find that your train ticket is on a waitlist. This is quite common and to find out whether your ticket is confirmed you need to check your current PNR status. You can easily do this online at www.irctc-pnr-status.com . To see the current status of your train ticket on the IRCTC booking system waitlist, just use the form at the top of this page. PNR stands for “passenger name record” and it tells you your current status on the WL (waitlist) or RAC (reservation against cancellation queue). If you buy a WL ticket or an RAC ticket, you will be assigned a unique 10-digit PNR number. The easiest way to check your PNR status is to submit a request on our website www.irctc-pnr-status.com or on official Indian Railways website. Note: the correct format of the sms text is ‘9876543210’ (sample number – use your unique PNR number). Note that you just need to type your 10-digit PNR number. One of the best is "PNR status app" which you can download from the Google Play store. There is no dedicated iPhone app to date (10/2014). We will let you know once one is available! 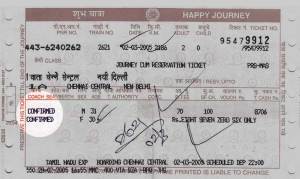 When all available seats on a train are sold, the railway ( Indian Railway or IRCTC ) releases RACs for railway reservations. Once all of those are sold, WL tickets are released. On almost every train, tickets are canceled for a variety of reasons. These cancellations can get you on the train if you bought an RAC or WL ticket. When the reservation chart of a particular train is ready (usually meaning that the train is due to depart in a few hours) and there are still some available tickets in different quotas, those will be given to RAC/WL ticket holders. You are booking a ticket online (Indian Railway, IRCTC, etc…). You find the train and class/seat/berth that you want along with the date and time. At the end of the reservation, you buy a ticket with WL5/WL2. In this example you joined the WL at position 5, but by the time you actually bought the ticket online you moved to position 2 (due either to a cancellation or to someone not making a final booking). The first number will stay the same – it indicates when you JOINED the queue. The second number will decrease until you get a ticket (hopefully). WL 5/WL 2 = Waitlist ticket: you cannot board the train. WL 5/RAC 3 = RAC ticket: you are allowed to board the train, but you may end up on a seat instead of a berth. WL 5/CNF = Confirmed ticket: you can board the train and you have a berth to yourself. 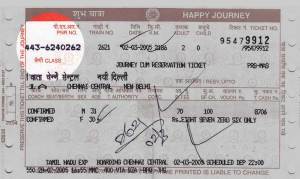 If your train is ready for departure and its reservation chart is finalized, the cost of your WL ticket will be automatically refunded to your bank account. NOTE: There can be significant movement on the waitlist on the very last day, so you may get an RAC status at the last minute. In such a case, you will not get a refund, as an RAC is actually a boarding ticket.